Manolo says, the Manolo’s internet friend Joan has alerted the Manolo to something very amusing. This evening, while reading James Lileks’ delightful ramblings on The Bleat, I was charmed to see that he had included a photo of the cover of the January 1955 issue of the pulpy magazine Galaxy Science Fiction. At first glance I took it to be nothing more than a typical almost-racy illustration of way-out stylings, but then the shoes caught my eye: Mr. Jacobs’ Backward Heel. Oh, yes, the left shoe looks a little odd, but I believe that’s because it’s being polished by that strange device. The right shoe, firmly planted, most clearly shows a backward heel. The Joan is exactly correct, those shoes on the future Rocket-Age hottie are far more spectacular than the more pedestrian Marc Jacobs backward heel shoes, or even the more fanciful Junko Shimada shoes. And now the Manolo has begun to look for more examples of retro-future shoes, (shoes of the future as pictured in the past). If you know of any, please tell the Manolo. Manolo says, apparently the conciet at Monday’s Marc Jacobs show was that everything was cuckoo-nutty bass-ackwards, and thus the show began with the designers bow, and went backwards (and/or downhill) from there. Naturally, the perfect shoes for such presentation were those with the “backward heel.” The Manolo’s internet friend at the Cuffington blog suggests that there may be the physics lesson here. Frankly, the Manolo is not feeling these shoes. As for the clothes, this quote from the NY Sun’s Pia Catton made the Manolo laugh. The evening dresses had a peculiar “Beetlejuice” quality: one-third Goth, one-third downtown, one-third cat-loving, nutty-artist girl — not exactly man bait. Finally, you will notice from the short video clip below that the music was not played backward. And for the very good reason, as everyone knows what happens when you play Ravel’s Bolero backward. Manolo says, it is Friday, Celebrate! Here is the new peep-toe platform pump from the Marc by Marc Jacobs which would be perfect for wearing during your frenetic and perhaps self-destructive, club-hopping, paparazzi-evading, typical D-list-celebrity summer weekend. Manolo says, the Manolo’s latest column for the Express of the Washington Post is now available. I handle show dogs and, unfortunately, dog handlers are notorious frumps; think no-wrinkle poly-knits and ugly shoes. I am resolutely unfrumpy, so I need a pair of low-heeled shoes that are sporty, great for both indoors and outdoors, and will work with a suit for a formal occasion. And because my dog is a black and white whippet, the shoes can’t be black or white. Manolo says, it is no secret that the Manolo is the dog person. Indeed, as the tiny impoverished boy he owned the small rat terrier, although, in hindsight, given that “Pepillo” lived in the hole in the baseboard, he may actually have been the largish rat. This would have accounted for the rude reception the teeny Manolo received when he attempted to register Pepillo as the purebred with the Real Sociedad Canina de España. Nevertheless, the Manolo and Pepillo were devoted to each other as only the small boy and the small dog and/or rat can be, and many were the times the Manolo was lulled to sleep by the sounds of his gnawing. Here is the smart, tailored low-heeled shoe from the Marc Jacobs that would make the frumpier dog handlers envious of your style. Manolo says, yes, it is not quite the robin’s egg blue, but to the Manolo these patent leather peep-toes from the Marc Jacobs nonetheless augur the coming of the spring. Horray for the Red, the White, and the Blue! Manolo shouts, Happy Voting Day!!! Here are some appropriate shoes for the super fantastic girl who will today do her civic duty by voting. 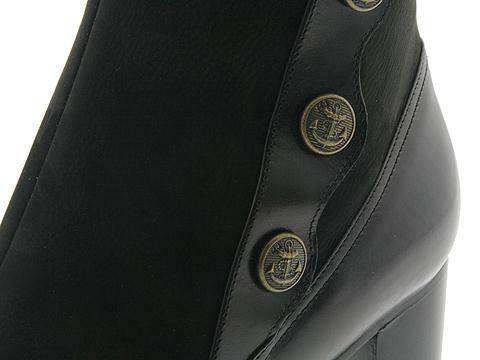 They are like the buttons on the pea coat! And thus these boots are now partaking of the nautical charm of that classic garment, making them the perfect feetwear for the brisk fall day along the shore. I love heels, especially all the new stacked heels out for fall. But I’m pretty tall at 5’10” and would hate to break the 6’ mark. Is it possible to have heels cut down? Manolo says, ayyyyyyy! Have the heels cut down? Have you no shame woman? Yes, you may have the heels cut down, although the Manolo doubts that any reputable cobbler would desecrate the beautiful shoes in such the manner, so you would have to do it yourself, perhaps with the series of inexpert blows delivered forcefully overhand with the small hatchet. Of the course, the real problem here, it is not with the shoes–the poor, innocent, much maligned shoes–but in the stead, the real problem here it is the habitual and unnecessary insecurity of the tall girls. It has been the experience of the Manolo that too many of the tall girls worry that if they wear the heels they shall appear freakish, and will not be able to attract the mens, who they believe are intimidated by their Amazonian stature. And so these beautiful girls spend their lives slumping their shoulders, slouching around in the flats trying to look shorter. Bah! The Manolo would have none of this! Stand proudly tall sisters! Throw back the shoulders and wear the heels, and the mens will fall over themselves attempting to climb your heights. The Manolo reminds you that some men like them the taller the better, for the example, the magnificent 5’8” tall Rod Stewart who has been married to both the 5’11” Rachel Hunter and the 6’1” Penny Lancaster. Wake up Maggie, and put on these beautiful stacked-heel patent leather shoes from the Marc Jacobs, shoes of which even the Rod Stewart would approve. Manolo says, the Manolo he needed to start the Monday with something pretty, and this ankle-strap skimmer from the Marc Jacobs, it is delicate and fresh and imbibes deeply of the essence of spring. 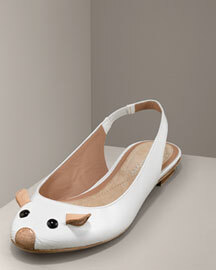 Manolo says, yes, this shoe it is from the Marc Jacobs, and yes, is the logical and ridiculous extension of the Marc Jacobs original’s mouse shoe. And thus you see how it is possible to cross the line from the witty to the obvious. Yes, the shoe above it is cute, but it is cute in the “Super Kawaii” manner favored by the girls of the Harajuku. The original mouse shoes of the Marc Jacobs they were clever and intelligent, they made the allusions; these shoes, they giggle at their own joke. Manolo says, here are the perfect pair of the boots to protect your feets from the weather while brightening the stormy day. 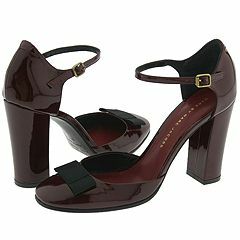 Manolo says, here for the working girl Wednesday is the stunning ankle-strap peep-toe shoe from the Marc Jacobs. You must look closely to see that the upper and the heel quarter they are covered with the hundreds of the little beads! Like the best of the shoes of the Marc Jacobs, this shoe it is fun, and flirty, and does not take itself too seriously. By the way, this shoe, it is also on the sale, nearly 40% off of the regular price.